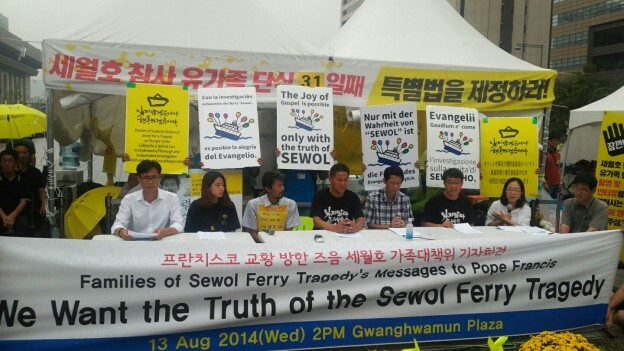 Families of Sewol ferry tragedy held a press conference on 13 August 2014, 2pm at Gwanghwamun Plaza in Seoul, South Korea to deliver their messages to Pope Francis who will visit South Korea on 14 August. At Gwanghwamun Plaza, Mr. KIM Young-oh who lost his daughter during the tragedy is continuing his hunger strike for 31 days as of 13 August 2014, calling for a transparent and independent investigation. As of today, 304 people, including 10 missing victims, died at the Sewol ferry tragedy which happened on 16 April 2014. Only 172 people survived from this tragedy. Even after 120 days, the Sewol ferry disaster is still ongoing. Families marched on foot from Ansan to Seoul (around 43 km), held weekly candlelight vigils, collected almost 4 million signature petitions, and continued their hunger strike to seek the truth of the Sewol ferry tragedy. Until today, Sewol families have continuously called to enact a special law for a transparent investigation and develop strong measures to prevent further tragedies like the Sewol ferry incident. At this press conference, families delivered their urge to seek the truth of the Sewol ferry tragedy and read their letter to the Pope Francis. The families of 4/16 Sewol Ferry Disaster wholeheartedly welcome Pope Francis who has been making the world a beautiful one by standing beside the weak and the suffering. We would like to express our utmost gratitude to Pope Francis for praying for us at the time of the disaster and allowing us to be with him on many occasions during his visit to the Republic of Korea. We will be with the Pope greeting him upon his arrival at the Seoul Airport on the 14th August, we will attend the mass and meeting him in Daejeon on 15th August, and participate in the mass at Gwanghwamun Plaza on the 16th August and the mass in Daejeon on the 17th August. After 120 days from the 16th of April, the effects of the disaster are still on-going. Hundreds of people lost their lives without proper search and rescue operations, 10 people are still missing and their family members continue to stay at Pangmok Harbor. Even though the President, the Government and the National Assembly all promised a thorough investigation, there has not been anything substantial done. For the enactment of a special bill for the investigation into the disaster, we have travelled around the country to collect almost 4 million signature petitions, and have continued sit-ins and hunger strikes at the National Assembly and Gwanghwamun Plaza. Every day for 120 days, there has been a situation where we have had to beg and struggle for the search and rescue, for the investigation of facts, and for the survival and recovery of the missing. We have to ask what the state, the President, the Government and the National Assembly are here for? The President and the Blue House disclosed less than 5% of the information requested by the Special Investigation Committee of the National Assembly, refused to disclose even the whereabouts of the President for 7 hours right after the disaster and have only been reiterating the fact that the Blue House is not the control tower for disasters. The National Assembly, which did not played any active role at the beginning of the disaster, started the special investigation into the disaster only after we stayed and monitored at the National Assembly for 3 days without sleep. We discovered that the special investigation was not functioning properly, for example, wasting half of its designated period discussing and deciding the objects and schedules of institutional reports and hearings. In addition, the discussion over the enactment of the special bill which has been heavily influenced by political interests, has been against achieving the goal of the bill and the thorough investigation that the people are demanding.. The enactment of the special bill we advocate for is for: 1) the highest quality search and rescue until the last missing person is found; 2) the most thorough investigation into the disaster; 3) the complete remembrance and recovery of the disaster and the victims; and 4) the building of a safe nation where every life is respected. We believe every person and institution responsible should be investigated, all relevant information should be disclosed, and in order to make it possible, there is a strong need for a committee with independence, expertise, coercive power, diverse investigation tools, and enough time and personnel. We also believe the core of the coercive power is the authority to indict and conduct criminal investigations. We feel confident that this is the way to prevent similar disasters in the future and to save more precious lives even when a disaster is inevitable. If our belief is wrong, we urge anyone to tell us so. When the President met us at the Blue House on the 16th of May, she promised that she would make sure we have no regrets relating to the investigation of the disaster. We have been asking the President why her promise has not been kept. The National Assembly, through its resolution on 29th of April, expressed its determination to do its best to reveal the cause of the incident and the truth clearly by thorough investigation. We have been asking the National Assembly why its determination has not been met. The President answered by blocking us, the people who simply wanted to meet her, while 2,000m away from the Blue House. The National Assembly replied by secretly coming up with an agreement on the contents of the special bill which is against ours and people’s will. We would like to have a dialog with Pope Francis who is willing to be with us. We would like to know the truth about the disaster. We would like to make such disaster never happen again. We would like to build a society where every precious life is fully respected and everyone is safe. We would like to share our will by being with the Pope, Catholics and people at Gwanghwamun Plaza, the center of the nation, where our dialog with the President has been blocked from only 2,000m away. We believe the Pope will share our wishes with all of those who are always ready to stand by the weak and the suffering in the world. We hope Pope Francis’ visit to the Republic of Korea will be an occasion where Catholic and universal values that every life should be respected and that everyone should be able to live in a safe society takes a strong root. My name is Jeong Hye-suk Cecilia from South Korea. I wholeheartedly welcome you and am looking forward to your visit to our country. My children and I, all of us devout Catholics, hold nothing but love and the greatest respect for you. We were long anticipating your visit and the opportunity to attend your beatification mass. On April 16, however, our hopes and anticipation were crushed by tragedy. I lost one of my two children, my 18-year-old son, in the Sewol ferry disaster that occurred in the southern waters of South Korea. My son, Park Seong-ho Emmanuel, was a good child who wished to be a priest like you, one who embraces others with tender love. We, the parents, were forced to stand by and observe as nothing was done to save our precious children. All we could do was wail as we watched them slowly drown. Other Koreans who followed this tragedy and the failure to mount a rescue mission on live TV bore witness to this tragedy and have long suffered in shock and sorrow. After the tragedy, we, families, want to know why our children had to die like that. At least, we want to know the truth. Were they not saved or could not be saved? Is it because of bad weather or because they do not have proper rescue equipment? We want to know. We believe that it is our promise and responsibility to find the truth for 304 precious lives that were lost during the tragedy, including my child. Unfortunately, even though 120 days has passed since the tragedy, we still do not know why our children had to die. Sewol families and Korean people desperately called for the truth of the Sewol ferry, but the government has no political will to seek the truth. We have continuously asked for an establishment of an independent commission which has full authority to conduct criminal investigation and indictment. The government refused this call because there has been no precedent. I am not familiar with the word ‘criminal investigation’ nor ‘indictment’. However, I need to know why my son had to die and why it is important to punish the responsible person. Isn’t it the job of national leader to carefully listen to a desperate man so that it is not just heard as wind? While appealing for finding the truth of the Sewol ferry to the government, we, families, walked on foot for 42km, from Danwon High School where our children used to go, to Gwanghwamum plaza in Seoul. We wore our children’s school uniform, carried their nametags so that we can feel their presence. We walked with them in spirit. Three members of the Sewol families carried 5kg cross and walked for 21 days. Some family members including myself went on hunger strike calling for the truth of the Sewol ferry tragedy. I was sent to the hospital after 7 days of my hunger strike. Yoomin’s father, who stays in Gwanghwamun plaza where you are going to hold beatification mass on 16 August, will reach 34th days of his hunger strike on the day of your mass. We are tired and exhausted, but when we think of our children, we will never give up. The parents who lost their child lost everything so cannot be exhausted. We, Sewol families, really do miss our children. I want to hold his hand, touch his face and listen to his voice even in my dream. I still clearly remember my son’s voice when he called me, the time when we walked to the church to attend the mass, and when we awaited your visit together. We profoundly hope that no one will ever again have to suffer the pain and grief that we are experiencing. We hope that no more precious lives, lives that our God loves so much, will fall victim to avarice. We hope that this country, which remains deep in sorrow under the shadow of death, can be made a safer place for all. This is why we are now holding back our tears and staging this hunger strike to make our call heard and create a country that values life. Please wipe away our tears and hear our stories. We pray for seeking our children’s truth. My beloved daughter Yoo-min liked to hug me and stay beside me. She was the daughter who hugged me from behind and called my name and put her arm under my neck as a pillow when I sleep. She did not even tell me that she was going on a school trip because she did not want to financially burden her poor father. I had to stand by and watch her dying in the capsized ferry as nothing was done to rescue her. The truth on my daughter’s death must be found. So that tragedies like Sewol should never happen again. To do this, we have continuously called to enact a special law for a transparent and independent criminal investigation and indictment. However, the government and ruling party avoided desperate calls from Sewol families and slandered us. Maybe it is because they are the ones who are responsible for this tragedy. We started a hunger strike to let people know about our desperation. If I cannot clearly find out the truth of my daughter’s death, I have no reason to live. I am willing to die for it. Until our version of special law is enacted, I will never leave this place. I heard that Pope Francis cares for the people who hurt the most and values peace and human rights. Please remember us. I lost my daughter who is more precious than my own life and continue hunger strike for 31 days to find the truth of my daughter’s death. I can continue my hunger strike for a month because my daughter Yoo-min is still alive inside my heart. The Sewol ferry tragedy is not about me only. This is everyone’s issue living in a society which prioritises financial interest over human, a corrupted and incompetent government who prioritises its power over its people. Please keep your eyes on our voices and give political pressure to my government. Please save us who helplessly lost our children. 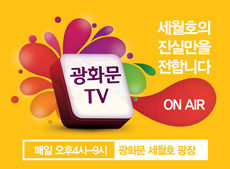 English | tag: pope, sewol, visit | 2014/08/13 by english.